It is quick and easy to drop in at Tractor Supply or some such all purpose farm supply place and buy a feed trough. A knee high trough made of a plastic inside liner and a light "beer can" thick frame is clean and quick. They are light weight, easy to haul and easy to drag around your Longhorn pens. 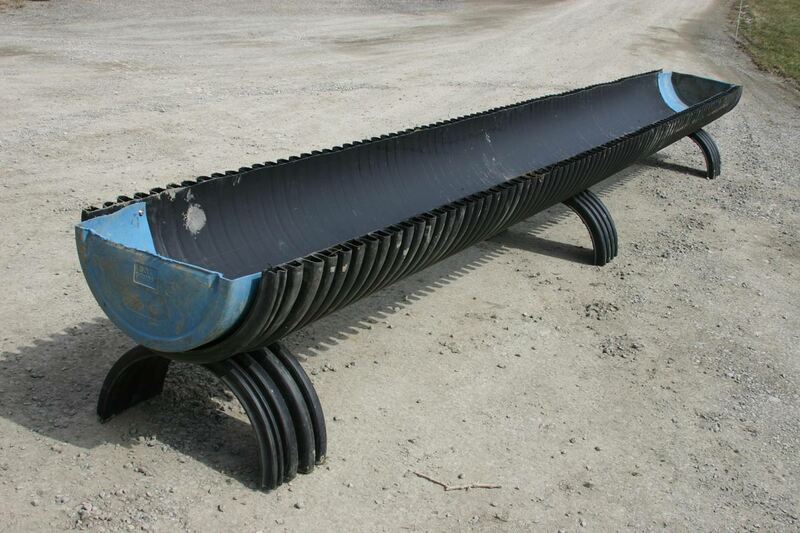 Today's price is $99.99 for a 5 foot trough----that is really close to $20 per running foot. At this point all seems well. However, a year down the road some frisky critters do a dance in the trough or in wet country the legs start to rust, and soon the whole unit looks like an Ace Reid west Texas pickup exhaust pipe. Having been there, we have experimented with numerous low maintenance, economical feeding troughs. Certain things that differ from the light weight economy troughs are badly needed. For many years we have made our own feed troughs. Here is how you will never have to buy another high dollar beer can metal trough again. 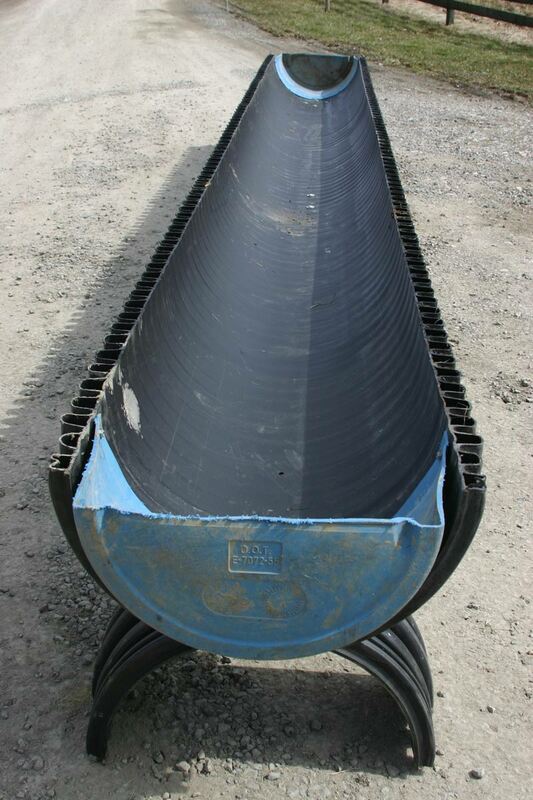 Purchase 24" double weight plastic culverts like the county highway department uses. Cut them in half length-ways with a saw. You then have two for one. Take clean used heavy wall plastic 55 gallon barrels and cut them in fourths. A section of the culvert can be sawed off to make the legs. Bolt the legs on with bolts and 2 inch fender washers. Use stainless steel or galvanized washers and bolts. Use the large washers and bolts on the barrel ends to attach them. Let the barrels stick out longer than these pictures show and you can have another foot or so of trough space. The legs can be longer or shorter to fit the age and size of the cattle. Turn the troughs up side down and drill a hole in each reinforcement ridge so water will drain out the bottom and not freeze. Drill a couple holes in the inside bottom of each trough so water will drain. These, unlike the Chinese made troughs, can be repaired (if ever needed) for the next 50 years. They are heavy wall plastic and will not rust. They can be made any size to fit the need. An 18" culvert can be sawed in half and attached to the inside wall of a barn. Don't worry about it wearing out. A 20 foot long culvert is about $10 per running foot depending on where you purchase. Cut it in half and that is $5, plus bolts, washers and used barrels----with a little thought and frugal shopping skills you will have about $6 per running foot cost on a completed trough that will last a lifetime.